It sounds like you have a lot of fun!!! 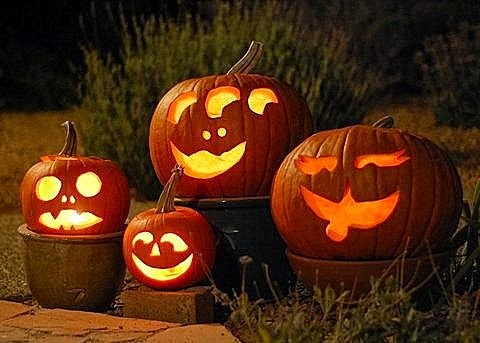 Love your carved pumpkins!!!! Happy halloween and hope you have another good one this year!! What a great post, such fun you obviously love Halloween. We don't really bother over here which is a shame. Have a great Halloween and make some wonderful memories. how lovely to have a community where halloween is such fun ! Whilst Hallowe'en trick or treating has become more popular here in the UK in recent years, something seems to have got lost in translation! It seems much more commercialised over here (as Ingrid said). Much less of a fun, party thing and some groups seem to make little effort to dress up. I've even had teenagers knock on the door and expect to be given money! Out of interest, at what age in your area do children stop trick or treating, Jennifer? It sounds like you all have a fabulous time. I think you get so much more out of these type of events when you put time in to them, and you obviously do with those fabulous costumes. I remember you writing about candy corn before, we don't have that here, I'd love to try it. Lovely post Jennifer, I feel like I'm trick or treating with you. You're making memories that your children will look back on with fondness in years to come! 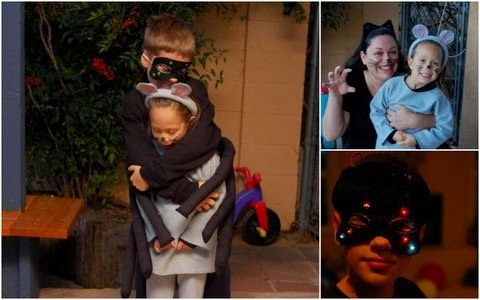 I loved your descriptions in this post Jennifer and your children look fantastic all dressed up for trick or treating. I do love the sound of that candy corn! I loved joining you for this trip to halloweens past and present! Halloween is so much more of an event in America than it is here (although the shops here are doing their best to get us to catch up!) but it's lovely to hear about it first hand and feel the joy of growing up with it. Great Halloween pics :0) Violet and I are spending today preparing for Halloween. We've just finished making some Chocolate Brownies. Then we'll be decorating the living room, making her a Black Cat costume and then carving our pumpkin. We don't go trick or treating, but it's fun to dress up and spookifying the house. A great display of Jack-o-lanterns, Jennifer, very spooky. 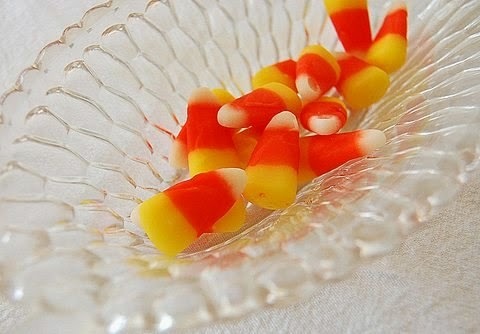 I have never had candy corn, but I must say it looks and sounds pretty and delicious. Love your costumes, and have a great time treat or treating. Happy Halloween to all the little bears. I always dress up, too!!!! I'm a boo-tiful witch with a funky witch's hat that I continue to embellish every year. It's quite full by now.....almost too full to add anything, but it wouldn't be Halloween if I didn't! Hope you all have a fun-filled, candy-filled, romp through the neighborhood tomorrow! I really like the look of those sweeties. I live in a town that will don fancy dress at the drop of a hat, so Halloween is a big deal. I loathe dressing up. I just.don't.get.it. This year is Olly's first proper Halloween party. He is beyond excited, although I envisage being back home within five minutes when it all becomes too scary for him! Have a great time with your Mouse and Spider. Jennifer, have you seen this recipe for homemade candy corn? Hi Jennifer! This is Ana from www.anaediblecomplex.com! I look forward to your posts and love all your pics! I was wondering if there's a way I can get in on the color collaborative movement? It's such a fun project! What a sweet post. Like you, I'm a candy corn snob. I'm that way with jelly beans too, at Easter, and sadly the brach's jelly beans are getting harder and harder to find. And you've made me realize -- I can't remember what costumes I wore as a child. I know I DID dress up because I distinctly remember the candy bags full of candy, but what characters did I choose? Hmmm ... I must call my sister and see if she remembers. Sounds like it's lots of fun, enjoy the celebrations, here the pumkin is carved and I've made some Spooky Bunting but that it's so far, tomorrow I need to stock up the cauldron with sweets. Have a great time. Sounds like you are really celebrating helloween! :-) Hope you had a wonderful day yesterday! Here in Germany, Helloween starts to become a tradition (brought in by the shops) - it was very cute to see some of the kids in their costums yesterday! Your pumpkin lanterns look great Jennifer. This year is the first for a very long time that we've not carved a pumpkin, probably because the girls haven't been here, and I've missed it. Hope you had a very happy Halloween and have a great week.